(Riviera Beach, Fla. – June 1, 2018) – The Lindsey Davis Garden Club, the Riviera Beach Community Development Corporation, (RBCDC), City of Riviera Beach Parks and Recreation, and Riviera Beach Community Redevelopment Agency (RBCRA), in partnership with BB&T Bank’s Lighthouse Project (NYSE: BBT) invite the public to the block party and ribbon cutting celebration for the new Willie “Bo” Davis Flower and Meditation Garden on Saturday, June 2nd at the Lindsey Davis Community Center, located at 1550 W. 28th Street, Riviera Beach from 10:00 a.m. to 2:00 pm. In early 2017, the Riviera Beach Community Redevelopment Agency (RBCRA) and RBCDC invited the Community Center’s seniors to the Riviera Beach Community Garden located at 1010 W. 10th Street. By late 2017, the volunteer group grew to more than 70 seniors resulting in the formation of the Lindsey Davis Garden Club and an initiative, Seniors Go Green. The volunteers helped weed the bed, pick vegetables and herbs, and maintain the community garden. The Lindsey Davis Garden Club saw an opportunity to utilize a corner of the Lindsey Davis Community Center to create another garden. Upon request, Richard Blankenship, director of Riviera Beach Parks and Recreation, approved the usage of the corner and a vacant, derelict lot to the west of the Center. 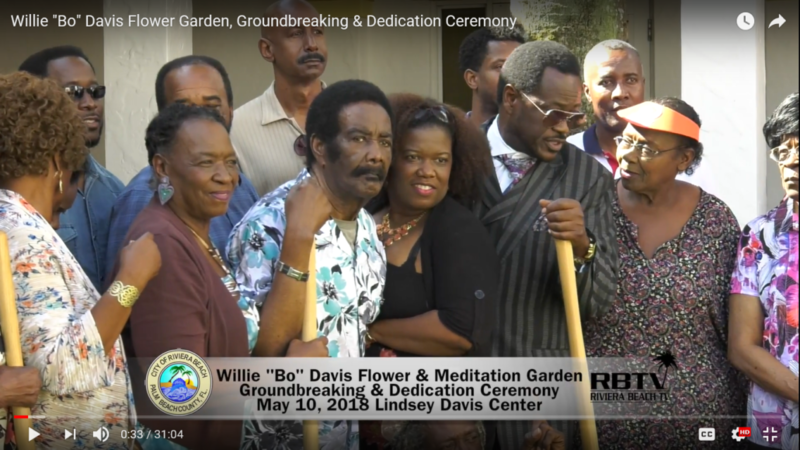 The garden has been named after one of the City’s pioneers, Willie “Bo” Davis. BB&T chose the Lindsey Davis Garden Club and its initiative, Seniors Go Green, for its prestigious Lighthouse Project for 2018. The mission of BB&T Bank is to make the world a better place; make a difference by building strong communities; and improving the lives of residents. In 2009, the BB&T Bank created the BB&T Lighthouse Project, an annual project that provides associates with the opportunity to make a difference and have positive changes in the community. The Lighthouse projects are humanitarian in nature, serve local community, and impact more than one single family. The RBCDC’s builds resilient, safe, innovative and beautiful neighborhoods; develops attractive homes; creates and supports economic development programs; establishes sustainable green places; and reduces food insecurity for the City of Riviera Beach residents. Additional to the meditation garden, the two-story Lindsey Davis Community Center features a game room, conference room, classrooms used for after-school programs, computer room, and more. To learn more about the Lindsey Davis Community Center, call 561-840-3170. The block party will feature free food, bounce houses, music and more. For more information, please call (561) 840-3170. The primary purpose of RBCDC is to operate within the redevelopment area of Riviera Beach as established by the City Council (“Redevelopment Area”), as well as the City of Riviera Beach as a whole, and acquire, rehabilitate and operate affordable housing units, to provide for safe, sanitary and decent affordable housing for families of modest means and/or the elderly, to provide investment capital to low income communities or persons of low income and to engage in other community development activities for neighborhood improvement and community and economic development by providing sustainable business and job opportunities for low income residents.